﻿ Fun Easy English - Travel the United States of America - Nevada. Learn before you travel. This section of Fun Easy English focuses on facts and other cool stuff about your favorite U.S. state. This is great English reading practice. 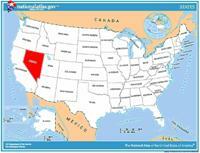 This page focuses on the state of Nevada. Nevada's name comes from the Spanish word meaning "snow clad"--a reference to the snow-covered peaks of the Sierra Nevada. The discovery of the Comstock Lode, a massive deposit of silver, in 1859 brought many fortune seekers. Statehood followed shortly afterwards in 1864, when Nevada was admitted as the 36th state. Nevada is in a mountain region that includes semiarid grasslands and sandy deserts, and is the most arid (dry) state in the nation. Like oases in the desert, Nevada's two main cities--Las Vegas and Reno--attract fortune seekers from around the world hoping to strike it rich in the many casinos located there. The capital is Carson City, and the state flower is the sagebrush. Nevada has had four state flags during its history. The first flag was adopted in 1905 (over 40 years after Nevada became a state in 1864). The current flag of Nevada was was approved in 1991. Nevada's flag has a cobalt blue background. A five-pointed silver star (silver is the state metal) is positioned in the upper left quarter of the flag between two sprays of sagebrush that cross to form a half-wreath (sagebrush is Nevada's state flower, and one of Nevada's nicknames is "The Sagebrush State"). Across the top of the wreath is a golden scroll with the words "Battle Born" in black letters. 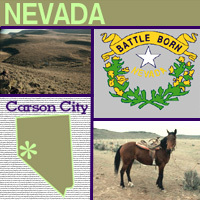 The phrase "Battle Born" signifies that Nevada entered the Union during the Civil War. Below the star, in golden letters, is the name "Nevada." Origin of Name From the Spanish "Sierra Nevada," or "snow-covered mountain range"
Travel and tourism site for Nevada - This state travel and territorial tourism site provides ideas for your vacations, meetings, and more. Can you balance a jar on your head that is filled with water, like the woman in the photo is doing? (Don't try this indoors or with something breakable!) The woman in the photo is in Native dress. At one time, women carried water on their head so their hands could be free to carry other things as they gathered food for their families. Each spring, Henderson's Clark County Heritage Museum in Nevada hosts the annual Native American Arts Festival. This three-day festival highlights traditional crafts, foods, arts and culture. The dancing performances are very popular. Native American dancing often involves singing and the wearing of elaborate clothing decorated with feathers, beads, fringes, and sometimes bells. Men and women usually dance separately, even if they are in groups. There are different contests to see who can present themselves in the most authentic manner, and performers spend much time working on their outfits. Many of the artisans show how to make local Native crafts such as pottery, sand paintings, baskets or cloth. Each year, thousands of people come to the festival. Its location near Las Vegas makes it easy to reach for many visitors. The museum itself is an interesting place. You can see different kinds of minerals at a mining exhibit, look at a 1918 railroad steam engine, or even visit a re-created ghost town! The Great Basin, which includes the region of northern Nevada, is wide-open territory primarily known as cattle country. Amid the desert and mountains is the Humboldt River, which begins in the mountain ranges and ends in the desert. This is the home of the buckaroos, cowboys who work on cattle ranches in Nevada. They get their name from vaquero, (pronounced bah-care-oh) the Spanish word for "cowboy," because the first buckaroos in the area were Spanish-speaking horsemen. Buckaroos have developed many different special skills to work with the land and cattle. They run cattle drives, rope and brand cows, and shoe horses. They are most famous for breaking (making suitable for riding) horses, also known as "starting colts." But buckaroos also bail hay, mend fences, and haul trucks out of desert mud holes. They work long hours for low wages, but buckaroos are rugged independent people who choose to work close to nature. If you think of Nevada only as the state where the city of Las Vegas is located, you'd be ignoring its long and interesting history. Originally, many Native American tribes occupied the area that is now Nevada. Ancient Native American culture goes back at least 10,000 years, and still today, the state is home to more than a dozen tribes. In 1855, a group of Mormon missionaries were the first non-natives to settle in the Las Vegas Valley. They built an adobe fort, which is now a museum. The area appealed to them because of the valley located along the Old Spanish Trail. In fact, Las Vegas means "the meadows" in Spanish. In addition to the Mormons, pioneers moving westward sometimes settled in the area, and the Pony Express riders cut through hundreds of miles of what is now Nevada to deliver mail. After the discovery of large gold and silver deposits in 1859, more people arrived in the hopes of striking it rich. In the early 1900s, Las Vegas became a railroad town and then in the 1930s the town grew further when gambling was legalized. Nevada is an attractive place to live for a lot of people. It grew by a whopping 66 percent from 1990 to 2000 -- the fastest of any state. The following is a description of national forests, parks, and monuments in the state of Nevada. If you plan to visit or live in Nevada for awhile then you should definitely plan to visit some of these fantastic places. As the largest National Forest outside of Alaska, Humboldt-Toiyabe occupies many of the mountains of Nevada's Basin and Range Province. Spring Mountains National Recreation Area is located near Las Vegas and is part of the forest. This national forest is also partially located in the state of California. Located in the Sierra Nevada, Inyo includes Mono Lake, bristlecone pines, the Long Valley Caldera, nine wilderness areas, and Mount Whitney, which at 14,505 ft (4,421 m) is the highest point in the United States outside of Alaska. This national forest is also partially located in the state of California. The Forest Service lands surrounding Lake Tahoe are managed by the Lake Tahoe Basin Management Unit, which was created in April 1973 in order to protect the lake's unique ecological and recreational values. This management unit is also partially located in the state of California. Based around Nevada's second tallest mountain, Wheeler Peak, Great Basin National Park contains 5,000-year-old bristlecone pines, a rock glacier, and the limestone Lehman Caves. Due to its remote location, the park has some of the country's darkest night skies. Wildlife includes the Townsend's big-eared bat, pronghorn, and Bonneville cutthroat trout. Remote, undeveloped mountains and valleys in Lincoln and Nye counties in southeastern Nevada. Mojave Desert landscape of dramatic red sandstone, canyons, forested mountains, ancient rock art, rock shelters, roasting pits, and a mining ghost town. A major archaeological site north of Las Vegas where thousands of prehistoric fossils, including mammoth, lion, and camel in an area that was once a wetland. This video is all about Great Basin National Park.